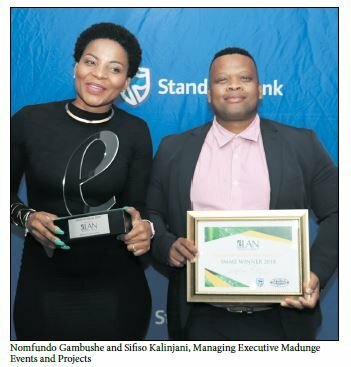 The Winner of the eLan Property Group SMME Award is Madunge Events and Projects. Madunge Events and Projects is a progressive 100% black African owned company based in Durban, KwaZulu-Natal. The company has a wide range of services which include: inhouse custom made furniture hire, tent hire, hotel venues sourcing, conferencing, exhibitions, media, government and corporate liaison, wedding planning, traditional functions, facilitation, co-ordination, event budgeting, corporate and social investment initiatives activations and property management. In respect of sponsoring, the eLan Property Group SMME Award, Mark Taylor, CEO eLan Property Group, says that creating jobs and promoting small businesses is important in driving his projects. He added, "We aim to contribute significantly to the local population groups." New Generation Skills vision is to be the training provider of choice through quality service delivery that inspires leaders and managers to maximise their potential. The company has a national footprint in Durban, Johannesburg and Cape Town. New Generation Skills prides itself on high energy, experiential workshops that are delivered by professional facilitators. Chemweb primarily manufacturing cleaning detergents from industrial to household products. The company aims to offer total cleaning solutions to its customers by providing high quality products and auxiliary cleaning tools.